Somerton Town Council Planning Committee meet twice a month (if required) to review Planning Applications related to Somerton. The Committees observations are then sent to SSDC (South Somerset District Council) for consideration as the Planning Officers make their planning decisions. 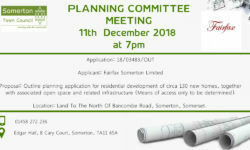 Somerton Town Council’s Planning Committee meeting on 11th December 2018 will include a planning application for the outline planning application for residential development of circa 130 new homes, together with associated open space and related infrastructure (Means of access only to be determined). The Town Council are consultees and will provided feedback to the Planning Authority who will make the final decision. Please consult the Poster attached and related Planning Committee Agenda to be distributed on 6th December 2018 via the Somerton Town Council Website or on the Market Place Noticeboard. Next post: Please see below the message from Somerset Waste Partnership.